Free speech is a core of our view of equalism. This freedom of expression is important even for the one person in the world who has a different view to everyone else. Hence: All Minus One. It’s not just that the individual has a human right to some kind of opportunity to speak up and be listened to. The opportunity doesn’t have to be a particularly equal one. A small attentive audience will do. So the one person need not identify with a victim group to amplify a collective voice … and lose their unique one in the process by the way. The ‘One’ is to be listened to by us ‘All’ because it’s in all our interests that we do. So this is more than just allowing someone to speak. The rest of us – well someone at least – needs to listen to what they say. Even harder than that, we need to think about the lone view and take the trouble to work it out or argue it through. Well, you say: That’s a very tall order! Life is hard enough without adding this impossible idea into it! Our social media world now has us do the exact opposite. Sure, social media enables anyone and everyone to express their views freely – though they may not be read. But when we read a Tweet or a view that we support, or watch a YouTube video, what we do is to click Like, Follow or ReTweet. Any view we don’t support, then we ignore it, or we try all kinds of ways to dismiss and rubbish it. Mostly we do that by ‘kicking the person not the ball’ – the ball being the view they’re expressing. It’s rare indeed for someone to take a view and argue it through. As good journalism gives way to playing to the populist gallery, it’s great to see new sources of careful thinking, thinking of the quality that can still be found in old libraries. Now we can find that in online institutions as well. One of these new online institutions is the Heterodox Academy. And Heterodox’s Richard V Reeves, Jonathan Haidt, and Dave Cicirelli have indeed taken a book off the old library shelf, and given us a bright new short online version: All Minus One. JS Mill wrote On Liberty in 1859. He was way ahead in his activism about inequalities like gender, race, and slavery. So, a model of his own free speech – one against the great majority then. His argument for free speech still stands the test of time. Get the important bit of JS Mill’s On Liberty in this free PDF version with great illustrations: All Minus One. It is clear that this is not a one-way thing. 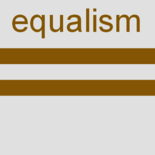 Equalism goes two-ways. The lone voice speaks out and will be heard. But that doesn’t mean the loner must be right or has some right to be obeyed because they are in a minority. The ‘One’ is a participant to be respected, not a victim to rescue. The ‘One’ needs to share in the argument and own the outcome. The ‘All’ need to make sure that, if they win, they win by careful reason, not by the power of numbers or off-the-ball tactics that we’re so used to in social media now. This is a new old world we’ve to learn how to do. Now spare the little time it takes to read: All Minus One … it’s been going viral for 160 years! This entry was posted on 9 June 2018 by Nick Child in Equalism in general, Free Speech and tagged Equalism, Free Speech.